Day 2 at the 2012 PokerStars.com European Poker Tour Berlin Main Event wrapped up on Wednesday after six levels of play. To begin the day, 329 hopefuls returned to action. At the conclusion, that number was whittled down to 102 and they are all in the money. Former EPT champion Anton Wigg, who won EPT Copenhagen in Season 6, maneuvered himself around all the obstacles he ran into on Wednesday and bagged up 695,000 in chips. That's good enough to claim the pole position, and he'll be the man to catch on Day 3. Wigg played a few big hands during the day, including clashes against Calvin Anderson and Davidi Kitai. The hand against Anderson came first and resulted in Anderson's elimination. He five-bet shoved with after Wigg had four-bet. Wigg wasn't messing around, though, and quickly made the call with . The kings held up and Wigg collected the pot. Then, in the last level of the day, Stephane Albertini opened the action with a raise to 8,500 from middle position before Wigg three-bet to 18,500. The blinds were 2,000/4,000/500 and Kitai was in the small blind. After action folded to him, Kitati four-bet to 45,000. The big blind and Albertini got out of the way, but Wigg put in the chips to make the call. The dealer ran out the flop and Kitai was first up. Both players had plenty of chips to play with and Kitai fired a bet of 55,000. Wigg didn't flinch. He studied intently, then motioned towards his chips with his right hand. As his left hand gripped firmly to his cards, Wigg counted out more than just 55,000. He slid the batch into the middle for a raise to 118,000. Kitai began to tank while the cameras caught the action. After a couple of minutes, Kitai turned over and tossed it into the middle. Wigg showed just the with a wry smile across his face and the dealer pushed him the pot, which sent him over the 600,000-chip mark. What's more is that Wigg has already won an event here in Berlin. Tuesday night, he took down the €2,000 No-Limit Hold'em Turbo Bounty for €37,250. Wigg wasn't the only player to have a great day on Day 2. Right out of the gate, EPT Snowfest Season 7 champion Vladimir Geshkenbein stormed to the top of the leaderboard. He made quads, he smashed trips with a straight, and also had his kings hold up in a big three-way all-in pot against and pocket jacks. All of his run-good combined with some very solid play meant he was just about as unstoppable as one could be in a poker tournament. After entering the day with 201,600 in chips, Geshkenbein finished on 670,500, which is good enough for second place overall. And then there were the Team PokerStars Pro members. Out of that bunch, Vanessa Selbst had the best day in her quest for poker's Triple Crown achievement and wrapped up the day with 374,500 in chips. She'll be on a short list heading into Day 3 as Martin Staszko, Angel Guillen, Alex Kravchenko, Barry Greenstein, Viktor Blom, Juan Manuel Pastor, George Danzer, Theo Jorgensen, Bertrand "ElkY" Grospellier and Pierre Neuville were all eliminated on the day. The other two Team Pros still alive are Jan Heitmann (129,000) and Ana Marquez (99,000). 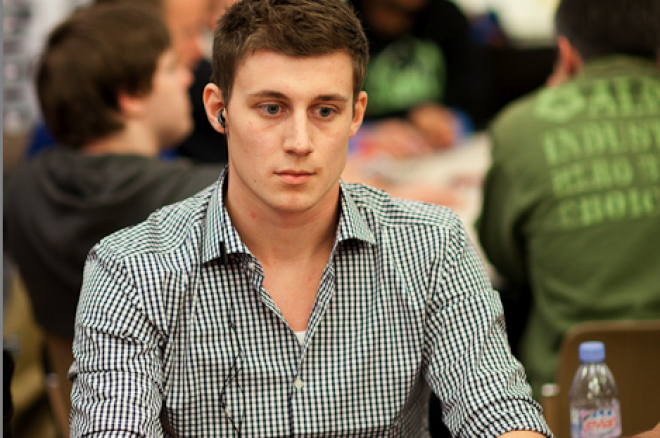 Another notable player still in contention is EPT Berlin Season 6 champion Kevin MacPhee. He finished Day 2 with 390,500, which is more than the 258,000 he finished up with after Day 2 in 2010 when he went on to win the event for €1,000,000. With all 102 remaining players in the money, that means there must have been a bubble at some point in the day. Finishing in 113th place was EPT London Season 7 champion David Vamplew. After Heinz Kamutzki raised preflop, Vamplew three-bet shoved for 61,500 and his tournament life. Action got back to Kamutzki and he made the call holding . Vamplew was in front with , but not for long. The fell on the flop and Kamutzki took the lead. The on the turn was no help for Vamplew and neither was the on the river. Play will resume on Thursday at 1200 CET (0300 PDT) and the plan is to play down to the final three tables. The PokerNews Live Reporting Team will be on hand for all of the action and we hope you're there to join us! We'll see you then. *Photo courtesy of Neil Stoddart.